Is there anyone out there either building or who has built a Desperado. I need to make up my mind on what power I will use. should I use I/O power or keep it simple with outboard. 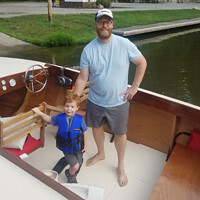 I have never built a boat but have owned several in the past. I never have chosen the power only took what came with the boat. I am having problems sourcing 3/8'"marine plywood for the side panels on my Desparado. Is 1/2" too heavy or to stiff to use in stead of the 3/8/"
Thanks for getting back to me. I really do agree that 1/2" would be tough. I am new in this boat building business bu what about two layers if 1/4". That seems to be easier to handle especially with the bending. What do most of the builders do accomplish their side panels. The entire transom doesn't need to be the full.thickness. Just the motorwell area. At least that's my interpretation and how I built my boat. So depending on the size of your motorwell you should have enough for three thicknesses of 3/4. My boat has a 150 bolted on 1 3/4" thick transom. It is painted but I assume it is plywood. Two layer of 1/4" should be fine, or a top layer of 1/8" if you can get it, to make 3/8". Take care with frame placement, faring, and clamping the plywood, bending on the thinner material will magnify anything that is off. Thanks on the transom thickness and it does make sense. My Concern is with the rest of the transom only 3/4" is that enough to handle the torch of a 150 hp outboard ? I also like the idea of 1 1/4 " with a layer of 1/8" on top. I could do that in mahogany "I think"
only 3/4" is that enough to handle the torch of a 150 hp outboard ? Well I finally got my Desperado on the form. laid d the keel and stem today and it is looking good. I am going to have to stop for about 10 weeks. We are leaving on an RV Caravan and won't't return until the first week of November. I wish now that I hadn't signed up for the trip because this boat building project is really getting interesting. Can't wait to get back.